Flavour Works Catering & Special Events offers internationally-inspired American cuisine and event planning in Central Texas. Flavour Works' cuisine features recipes inspired by the many countries that founder Phyliss D. Williams lived in during her 40-year career with the U.S. State Department Foreign Service and Department of Defense. We offer flexible event planning and internationally-inspired menu design for corporate events, receptions, family gatherings, and other special events upon request. Flavour Works Catering and Special Events is a Certified Minority Woman-Owned business designed to meet the catering needs of the diverse and ever-changing Central Texas region. Flavour Works was founded by Phyliss D. Williams. Inspired by her extensive world travels, Ms. Williams has a passion for international cuisine. Her custom recipes incorporate exotic ingredients and spices from around the world and fuse them with traditional American cuisine. In addition to unique and diverse menu offerings, Flavour Works prides itself on hospitality and commitment to quality. Each event is meticulously designed to fit the occasion and meet our clients' needs. Flavour Works Catering & Special Events is located in greater San Antonio, and our range covers much of South-Central Texas. Please notify us of your location preference in your request. Available seven days a week, 8:00 am to 12:00 am (midnight). Hours are flexible to meet client needs. We will create a menu that will suit your needs and budget; from corporate events, to buffet receptions, formal sit-down dinners, graduation events, quinceaneras, charity galas, family reunions, to wedding receptions and many more. Please browse through our sample menus and contact us to schedule a tasting. 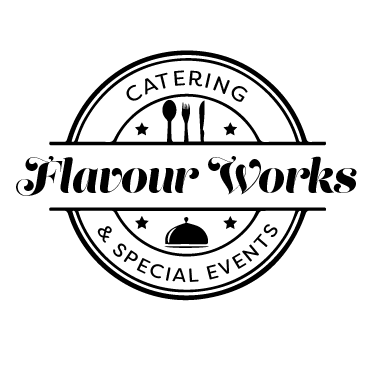 Flavour Works Catering offers delivery of custom meals, decor and disposal supplies directly to your home or venue, for any special occasion. Want to host Thanksgiving, but don't have time to prepare the entire meal on your own? Need to throw a birthday party for your friend or family member? Visit our Meal Delivery page to learn more. With Flavour Works your special event needs are treated with professionalism and care from beginning to end. Through our expertise and service offerings, we help you with the planning and execution of your event including: invitations, venue selection, table and chair rental, entertainment, decor, catering, set-up and clean-up, staffing, gifting, budgeting and more. Flavour Works makes hosting a party a snap, right down to the last detail. When murder is on the menu, you’re in for an evening of fun. Hosts and their guests assume the roles of suspicious characters and solve the mystery with the help of a coordinator. Each play comes with a party planner, invitations, costume and menu suggestions, clues and much more! Everyone's a suspect when murder is on the menu. A trip, party, dinner, barbecue or other event turns to tragedy when a guest is murdered. No one knows which of the other party guests committed the crime. Clues will be uncovered and motives revealed as you and your guests search for the killer. WHAT HAPPENS AT YOUR MURDER MYSTERY PLAY? Our Murder Mystery Dinner Party events are ideal for parties of at least six and up to twelve participating guests. Some of your guests will be the suspects, one which is the perpetrator of the murder, which took place in time before the event. During the party, your guests will be given clues and encouraged to collect information about the other suspects to solve the murder. Throughout the party, certain events will occur that will move the story along. When you book an event with us, we will provide a murder mystery coordinator to make sure things go smoothly, answer any questions you may have, conduct the pacing of the event and dinner. The identity of the murderer will be revealed at the party’s conclusion. CAN I BE A SUSPECT, YOU ASK? Yes! All of the suspects are played by guests, even the murderer! As a suspect, you will be questioned by the other participants about your relationship with the victim, your possible motive, and your whereabouts at the time of the crime. CAN I PLAY A ROLE WITHOUT BEING A SUSPECT? No, not a speaking role. Some characters are friends and acquaintances of the suspects, (other invited guests) and think they have vital information about the players that may or may not be essential to solving the murder. These guests are not characters with a part in the play, but are encouraged to mingle (before the play and during dinner) with all the guests and divulge the information they have. DO YOU HAVE TO PLAY A ROLE AS A CHARACTER? Not if you don’t want to. You can interact with the characters as yourself, trying to solve the crime along with everyone else. Generally between three and four hours long. ARE OUR EVENTS APPROPRIATE FOR CHILDREN? The mystery scenarios contain a fair dose of murder and mayhem, including the possibility of secret affairs. We do encourage the participation of teenagers and young adults, but the event probably isn’t suitable for children under 13. DO WE PROVIDE THE FOOD AND THE VENUE? Yes, we can cater the event and recommend/suggest venues. We have a detailed discussion upon booking with our clients concerning their specific menus, decor, music, costumes, photo ops and provide other suggestions related to their specific play/event. Murder Mystery packages include fine dining, a great and funny mystery, and a coordinator. Please contact us for a pricing estimate based on your party size and preferences. Pricing dependent on party size. *For full listing of specialty drinks, please contact us. Bartending services available upon request for alcoholic beverages. Let us help you plan your next special event or cater your meeting! Fill out the form below to schedule your free consultation or inquire about any of our services. We look forward to serving you.